Wall Street is on edge, placing bets when their crack cocaine, quantitative easing will be removed. The Federal Reserve said they would have to taper quantitative easing if inflation went past their target rate. As a result, Wall Street goes nuts over the Producer Price Index and the July Consumer Price Index, writing wrong interpretation after wrong interpretation, all trying to figure out what will happen at the next FOMC meeting. First, let's look at CPI and PPI for this month. CPI increased 0.2% for the month. CPI measures inflation, or price increases at the retail level. PPI measures wholesale inflation and is often a precursor to CPI in the coming months as those price increases are passed onto consumers. PPI had no change for July. From a year ago, CPI is now up 2.0% while PPI has increased 2.1%. The below graph shows the change from a year ago for CPI, in blue, scale on the left, against PPI, in maroon, scale on the right. What this graph shows is PPI and CPI do mirror each other somewhat and the graph also shows the deflation experienced in the recession, brought in part by the collapse in global demand as well as gasoline and energy prices. 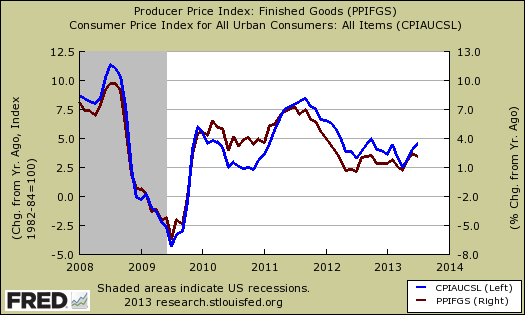 The thing is, the Fed does not watch the main CPI and PPI numbers for inflation and deflation. They look at core inflation numbers, which remove volatile energy prices, such as gasoline, as well as food, out of the equation. Core inflation, or CPI minus food and energy items, increased 0.2%, for the month. Core inflation has risen 1.7% from a year ago. Graphed below is the CPI core inflation change from a year ago and we can see it is low historically. PPI minus energy and food wholesale prices is also historically low in the change from a year ago as shown in the below graph. The monthly increase was 0.1% and the change from a year ago is 1.2%, a level not seen since November 2010. The above results show first and foremost, inflation isn't a problem. St. Louis Federal Reserve President James Bullard gave a speech outlining criteria to taper quantitative easing. They are GDP, employment, inflation and the outrageously growing Fed asset purchase balance sheet. The Fed actually pays much closer attention to the price indexes of personal consumption expenditures, or PCE. The change from a year ago in the PCE price index is 1.3%. The core PCE price index yearly change is 1.2%. Graphed below are both the PCE price index, in maroon, and the core PCE price index, in blue and their percentage change from a year ago. Here again we see prices being too tame for the 2.0% long run average target quantitative easing criteria goal. As a result of the above very tame inflation figures, Bullard said this with respect to quantitative easing and the Fed's 2% target inflation rate, using the PCE price indexes. The Committee would not normally remove policy accommodation in an environment where inflation is below target and is projected to remain there. In fact core inflation is hitting the 1% unacceptable level according to Bullard and worse, the Fed isn't sure why inflation has been so tame. Reduced global demand will reduce inflation and is cited as one possible cause. Bullard is concerned that tapering quantiative easing will cause deflation if the current price indexes are not an aberration (his words). The resolution of the tapering debate will depend on additional macroeconomic data from the second half of 2013. In spite of Bullard's and other Federal Reserve officials statements and the overall still very piss poor economic data, some quantitative easing watchers out there believe July's CPI numbers alleviate the Fed's deflation worries. From the above data, we think not. You may wonder what's the big deal about deflation and low inflation anyway? Deflation is actually bad and usually implies an increase in debt, less credit and less money available to the economy. Lower prices usually implies super weak economic demand and this in turn increases unemployment. Left to it's own devices deflation can turn a recession into a depression, as producers cannot even make back the money they poured into their products, thus firing even more workers and thus causing even weaker economic demand. The Fed wants to see moderate inflation for producers get higher prices, thus more profits, wages are supposed to increase (theoretically) and all of this in turn increases demand and employment in the economy. The markets this week went nutso as foreigners bailed and Treasury bonds jumped as traders believed tapering would be announced next month. Frankly the worst part about quantitative easing is QE's status as Wall Street's drug of choice. They are not trading on the real economy, earnings, even the employment figures. Traders are like a herd of sheep all placing their bets on when the Fed will stop their asset purchases. Frankly that looks like the biggest problem the economy really has, the knee jerk herd behavior traders exhibit, along with their high frequency trading computerized algorithms. If any of them bothered to study past a headline, they would see clearly the Fed is not going to stop asset purchases suddenly and probably will not start tapering at all in September. If they do anything it would be $10 billion or less in monthly asset purchase reductions. That's still $75 billion a month in Wall street crack cocaine quantitative easing. The economic numbers don't back up the claim the Fed is suddenly going to stop. Anyone can read these figures and see the Fed criteria to taper quantitative easing is below their targets. Yet like skittish wild horses Wall Street pumps out bogus analysis on when the Fed will stop asset purchases on the minute. Folks, CPI did not ease the Fed's worries about deflation, bottom line, so stop freaking out. The quantitative easing fix will continue to be available for awhile and nobody is going cold turkey.